I have no idea if the humble, but oh so very delicious, vanilla slice is an Australian creation or not, but I am more than happy to enjoy one every now and then. So last week when the topic came up in the Member's forum, and Coles had Lattice biscuits on sale, it didn't take too much encouraging to have me dragging out the slice tin, whipping up a custard and making a passionfruit icing. Because if it doesn't have passionfruit icing it isn't a real vanilla slice (a bit like neenish tarts that have white icing instead of pink - it's just wrong!). I'd love a passionfruit vine but we don't have the room so I had to resort to using a tin of passionfruit pulp. Of course that was way too much so the excess is frozen in ice cube trays. Anyway, back to the vanilla slice. I remembered my mother making the lattice biscuit vanilla slice when she was too busy to make the pastry from scratch so I wasn't at all worried about giving it a try. I did have to buy two packets of the biscuits though. You'll need a slice tray about 16cm x 26cm (or a Tupperware slice container works just as well). Line the tray with baking paper, making sure it comes up the sides so you have a "handle" to lift the prepared slice out. Place a layer of biscuits in the tray, shiny side up. Make a nice thick vanilla custard. Let it cool to warm then spread it over the biscuits. Place a layer of biscuits over the custard, shiny side down. Make a passionfruit icing. We prefer the icing to be reasonably thick so it sets quite hard (stops sticky fingers). Spread the icing over the top layer of biscuits. Place the slice in the fridge to set and chill, about two hours. Cut the slice into squares, using the edge of the biscuits as a guide. 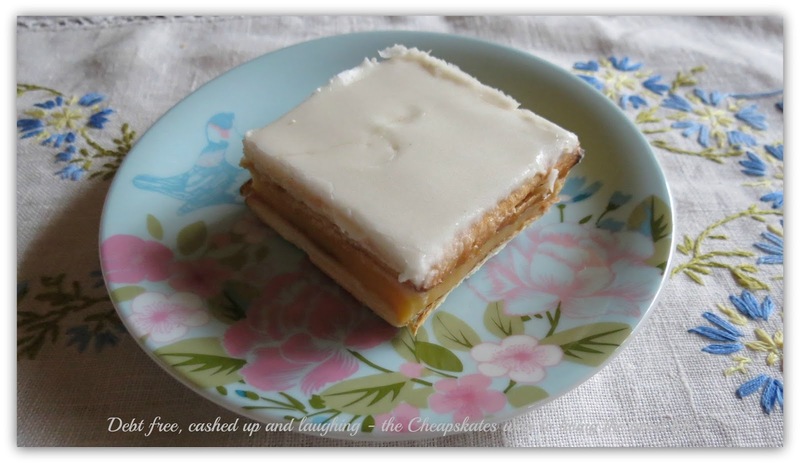 Make a cup of tea, use your best china and enjoy a fresh, yummy vanilla slice with your tea. Grease a 3cm-deep, 16.5cm x 26cm (base) slab pan. Line base and sides with baking paper, allowing a 2cm overhang at both long ends. Place 12 biscuits, in a single layer, in pan to cover base. Combine custard powder and 1/4 cup milk in a saucepan. Whisk until smooth. Pour in remaining milk. Add sugar and place pan over medium heat. Cook, stirring constantly, for 5 minutes or until custard comes to the boil. Cook, stirring constantly, for 2 minutes. Remove from heat. Cover surface of custard with plastic wrap. Set aside for 30 minutes to cool slightly. our warm custard over biscuits. Top with another layer of 12 biscuits. Refrigerate for 1 hour or until set. Sift icing sugar into a bowl. Add 1 tablespoon passionfruit pulp. Stir to make a thick icing, adding more pulp if required. Spoon icing over slice. Refrigerate for 1 hour or until icing sets. Cut slice into squares, using shape of biscuits as a guide. Serve. I got really excited when I came across this recipe last night, and actually went and bought a packet of Lattice biscuits to make it. Only when I was nearly done did I find - there aren't 24 Lattice biscuits in a 200g packet! Bother - I'll remake and update the recipe. You will need to trim the biscuits to fit the tray, so use the trimmings too.